Responding to customer requests, Windham Wines is now offering wine clubs for the wine curious. For $60 per installment, those who join would receive 2-3 bottles every other month starting in February. We provide notes giving you the stories of people and place as well as suggesting food pairings. We offer two clubs, one for those who drink only red (Vineyard), the other for those interested in exploring all styles of wines (Terroir). Please email us or call the shop (802-246-6400) to join either club to receive future installments. Here is an example of a note for the Crotin, Barbera (priced at $17) that was in the inaugural Vineyard Club that included a trio of reds from Piedmont– Nebbiolo, Barbera and Dolcetto. Barbera is the most planted variety throughout Piedmont. As Bastianich and Lynch observe, “[w]ithout a doubt, [Barbera] is the most adaptable and vigorous of Piedmont’s three main red grapes.” It is the third most planted red grape of Italy-after Sangiovese and Montepulciano; the most planted variety in Piedmont. Greater than 60% of Italy’s Barbera comes from Piedmont. Until the mid-1980s, in fact, Barbera competed with Sangiovese as the most planted red grape in Italy. Like Colorino in Tuscany, Barbera was often used for blending in Piedmont since it darkened the ruby-rust colors of Nebbiolo. People continue to associate color with weight of the wine, leading to these kinds of tactics to satisfy our aesthetic expectations. Barbera was also a simple Italian table wine, inexpensive and serviceable. Barbera lost traction in the late 1980s. In 1986, 8 Italians died and 30+ more were hospitalized after drinking Barbera laced with Methanol. Methyl alcohol is a colorless liquid with a smell like ethanol (the alcohol we drink). Why was it added to the Barbera in particular? A few factors coincided to create the incentive to those nefarious sorts who look for inexpensive means for personal gain. Firstly, Barbera was an inexpensive table wine for many Italians. It was destined for supermarkets and bulk sales to other EC members. Secondly, the 1980s, particularly 1984, 1986 and 1987 were cool, wet vintages in which grapes were challenged to ripen. It is sugar in the berries, itself the result of sun and a longer growing season, that gets converted to alcohol, adding pleasing flavors and a weightier mouthfeel to wines. In Italy, unlike parts of France, it is not legal to add sugar to juice to enhance the natural sugar. A bad vintage defined as under-ripe with low sugars will result in thin wines with green flavors. Methanol added weight and sweetness. Thirdly, at about the same time, EC rules shifted to support greater agricultural production, essentially rewarding yields over quality. For wine grapes, higher yields mean less concentration. That dilution, along with the thinness of the mid-1980s vintages in northern Italy, resulted in a larger supply of wine without a corresponding increase in demand. Those scoundrels referred to above recognized an opportunity to sweeten the wine and broaden its mouthfeel by substituting methanol for sugar. The problem– methanol is toxic at much lower levels than ethanol. It did not take the Italian authorities long to round up the culprits and identity the affected wines. In the short term, sales of Italian wine plummeted, with Barbera sales non-existent. Growers pulled out Barbera vines to plant varieties with less offensive history. Like the similar wine scandal the year before involving Austrian Gruner Veltliner, the longer-term result has been a massive upgrade in the quality of Barbera. 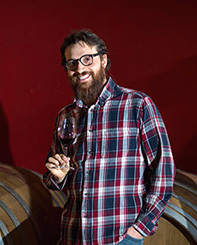 In 1986, Jancis Robinson dismissed Barbera as “low to medium quality, not fashionable.” By 2015, Karen MacNeil described Barbera as “Piedmont’s most juicy, straightforwardly delicious wine; . . . at its best, simply a captivating wine with a lot of flavor muscle.” After the mid-1980s, with less Barbera being produced, some growers began to give it a little love, planting it in better sites, limiting yields and even aging it, often in barrique. Barbera’s constants are low tannin and good acidity. Flavors and mouthfeel vary considerably, from entry-level bottles like this Crotin emphasizing fresh, tart red fruits with some savory, earthy notes to denser, richer dried fruit, spice and roasted coffee in oaked versions. Crotin is a family-owned winery and farm located in the village of Meretto, in the Monferrato hills outside of Asti. This area is not known for Nebbiolo, so Barbera can often find itself enjoying the better sites. Crotin is an agriturismo—a winery, working farm and bed and breakfast owned and operated by the three Russo brothers—Federico, Marcello and Corrado who split responsibilities among the farm, restaurant and bed and breakfast. They farm organically, including hazelnuts and honey (very common Piedmontese products, often chestnut honey). The winery focuses on indigenous varieties—Barbera, Freisa, Grignolino, even championing a white variety, Busanello. Incidentally, Crotin is the only winery producing the last as a single variety, not blended (Windham Wines carries it). The Barbera is harvested manually, then fermented and aged in stainless steel to show off its fresh cherry, raspberry and blackberry fruit, followed by some floral notes and a bit of anise. Only 250 cases are produced. Barbera, and the Dolcetto to follow, are about as food friendly as red wines get. Since the Crotin Barbera is unoaked, the acidity remains bright. It should be a ringer with tomato-based sauces; the acidity will actually make it a nice pairing with a creamy alfredo too (soon perhaps to be joined with some asparagus). The juicy, fruitiness makes it a good match for barbecue and the hint of fennel reminds me of an Ottolenghi recipe that converted me from a fennel avoider to one who appreciates it. I usually reserve this recipe for a nice rosé, but maybe cutting back a bit on the lemon zest, and serving the caramelized fennel over pasta will render this a new favorite pairing. Here is a link to a caramelized fennel recipe based on Ottolenghi and served over fettuccine.